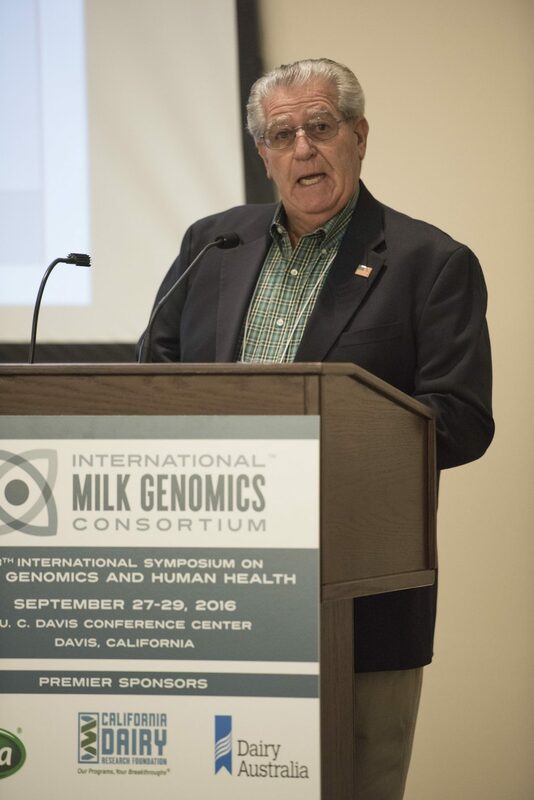 California dairy farmer, Gregory “Butch” Dias, welcomes guests to open the 13th Annual International Symposium on Milk Genomics and Human Health, held Sept. 27 – 29, in Davis, CA. DAVIS, CA – More than 100 international experts in milk nutrition, human health, genomics, lactation and computational scientists have gathered at UC Davis to discuss the latest discoveries in milk and lactation at the 13th International Symposium on Milk Genomics and Human Health. The symposium aims to foster scientific collaborations between milk science experts around the world and have real-world implications from dairy farmers to consumers. Gregory “Butch” Dias, a California dairy farmer and chairman of the board at the California Dairy Research Foundation (CDRF), opened the symposium with a welcome speech highlighting his involvement with the symposium through CDRF, from the very first symposium in 2004. “We are very excited to host this international conference to discuss the exciting discoveries of science related to milk and lactation and to plan for their application and opportunities for renewed research,” said co-chair of this year’s symposium, Dr. Bruce German of UC Davis. Executive Director of the California Dairy Research Foundation, Dr. Gonca Pasin, honored the recipient of the Most Valuable Presentation of the 2015 IMGC Symposium, which was held last year in Sydney, Australia. She presented a certificate of award and $2,000 to Dr. Bing Wang, professor of physiology and nutrition at the School of Animal and Veterinary Sciences of Charles Strut University in Sydney, Australia. 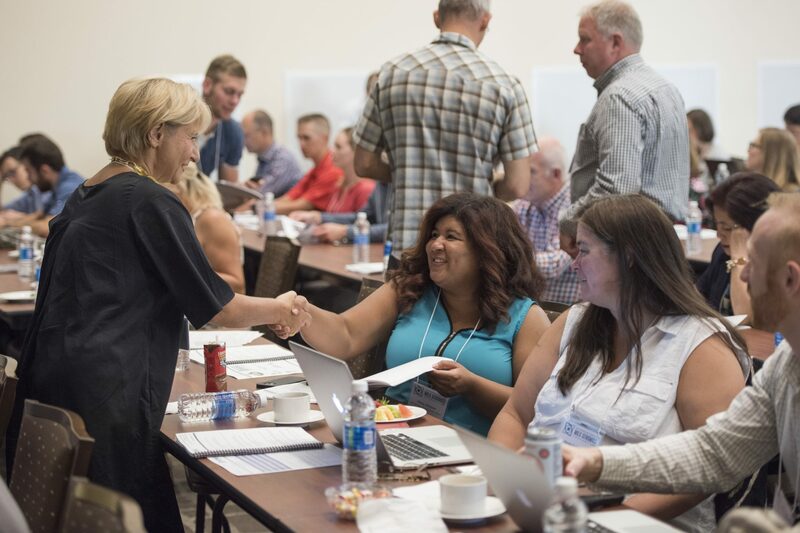 Dr. Gonca Pasin, executive director of the California Dairy Research Foundation, greets visiting scientists at the 2016 IMGC Symposium Sept. 27. Premiere sponsors of the IMGC are: Arla Foods, California Dairy Research Foundation, Dairy Australia, Dairy Farmers of Canada, Danone Nutricia Research, and the Dutch Dairy Association. For more information about the symposium, visit www.milkgenomics.org and follow @IMGCMedia on twitter. About the International Milk Genomics Consortium (IMGC): The mission of the IMGC is to provide a collaborative, interactive and pre-competitive platform for the scientific community and industry to accelerate the understanding of the biological processes underlying mammalian milk genomics and facilitate the transition of that knowledge into usable benefits for human health. For more information about the IMGC, visit www.milkgenomics.org. Categories: CDRF News, Press Releases Tags: California dairy, dairy, gut, IMGC, lactation, microbiota, milk, milk genomics, SPLASH!